Modern aftermarket engine management systems have developed and progressed a lot in recent years, most higher end aftermarket engine control units (ECU) now contain data recording functions, these can be activated in various ways. Here we are going to describe one of the ways you can activate the ECU data logging in the Link G4+ and Vi-PEC ‘iSeries’ ECUs. Now you need to set up your logging, this is found under the ‘ECU controls’ tab, ‘ECU Log File Setup’ or as we’re showing here, under the ‘Logging’ tab and ‘Logging Setup’. 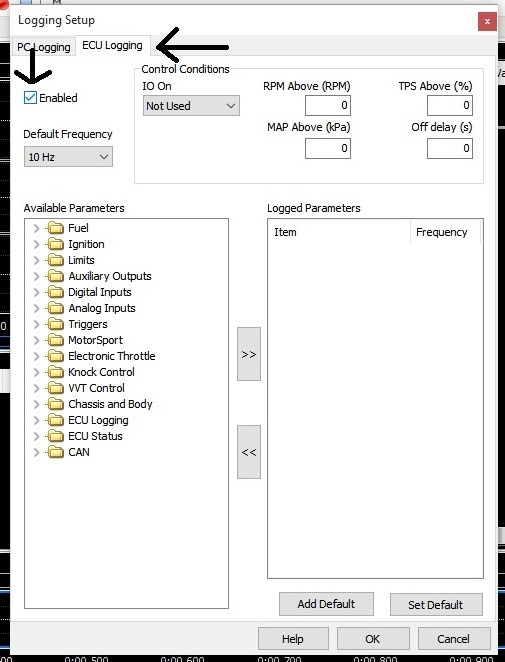 This gives you the option of setting up data logging with the PC connected or, as we’re going to do, ECU data logging. 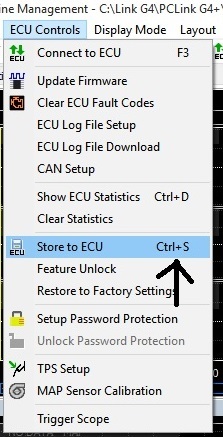 Once you have selected this a new window will open up, this is where you choose the ‘ECU Logging’ tab, check the ‘enabled’ box to enable the ECU logging. 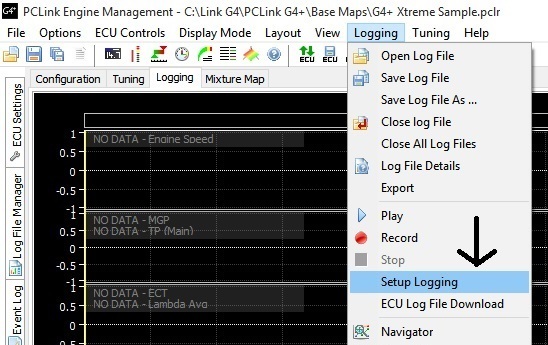 With ECU logging enabled in the ECU you now need to decide what you will use to activate the logging process and how long each log will last. We usually use throttle position (if the throttle is opened more than the set value, here we are using 50%, logging will begin) and record for as long as possible using the ‘off delay’ (if this is left at ‘0’ then it will only log whilst the activation condition is reached, here we have chosen the longest duration of 25 seconds). This means that once the logging is activated it will log for up to 25 seconds after the last activation. 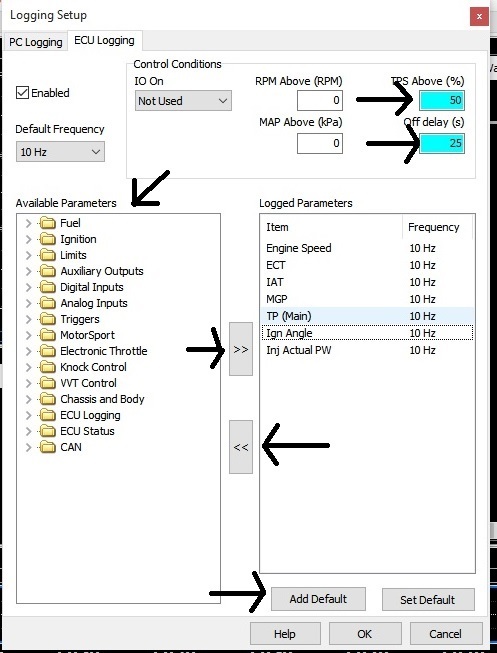 Other options for activating the logging are RPM above a certain range, MAP above a certain value or even something as simple as a switch. You also need to decide what parameters you want logged, key parameters can be added by clicking ‘Add Default’, you can set up and save your own default parameters. 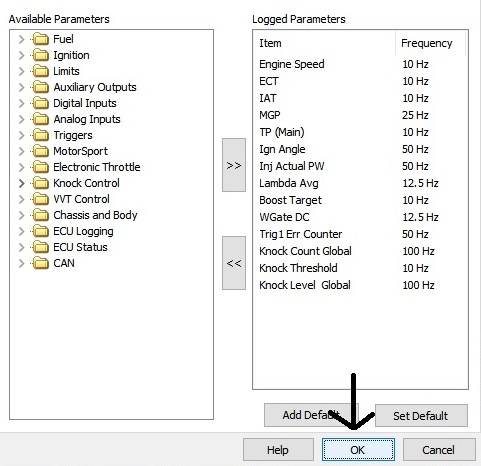 Every parameter of the ECU can be found in the left hand box (Available Parameters); to get the ECU to log it you click on the parameter you want logged and press the ‘>>’ button in the middle, this will put the data streams in the right hand box (Logged Parameters). For example, during a sprint race the driver will open the throttle beyond half way (50%) when starting their run, they will lift off for a corner and open the throttle again to accelerate through and out of the corner, as this will usually involve a lift off of 1-3 seconds the data recorder will continue to record data during the light/partial throttle (less than 50%) area and then the counter will be reset as they accelerate again. The counter will continue to be reset until the time in the ‘off delay’ has elapsed and it will put a marker in the data log to identify this. And then the changes will need stored, this can be done by going into the ‘ECU Controls’ and choosing ‘Store to ECU’ or simply pressing ‘CTRL’ and the ‘S’ button on your keyboard at the same time. 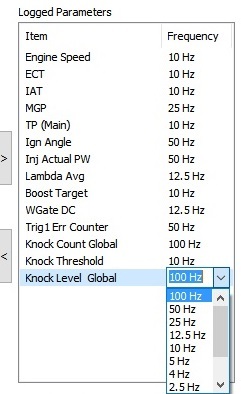 If you don’t complete this step all changes that you have made will be lost when you disconnect from the ECU.